What they do all day? 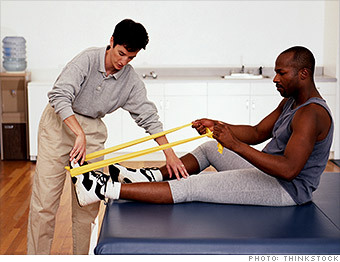 For people suffering from injuries or illness, physical therapists can be key to their recovery. They design tailored exercise and prevention programs, teach patients how to perform them safely, and help them regain movement and function. How to get the job? A doctoral degree in physical therapy is usually required — and it typically takes two to three years to get one. Candidates without a strong background in math and science may have to take some prerequisite courses first. PTs also need a license. Patience and a sense of humor are pluses. What makes it great? The workday is filled with small triumphs — a patient with a brain injury who learns to hold his head up again, an athlete whose range of motion improves after rotator cuff surgery. What's the catch? There's paperwork aplenty, thanks to federal guidelines and the home health aspect of this job. Therapists who do in-home visits may deal with a couple of hours of documentation each night. --K.A. Do Physical Therapist s have great jobs, or what?